SkyBank card program members enjoy a safer and more convenient lifestyle, thanks to SkyBank’s technology and dedication to customer centric service. SkyBank’s core GPR (General Purpose Reloadable) demographic suffers from egregious practices relating to the conduct of simple transactions, excessive fees and inconvenient practices stealing a disproportionate portion of employee compensation around the world. There is a simple solution to eliminate such abuse. SkyBank cards brings an entirely new way to load, save, and transact globally. 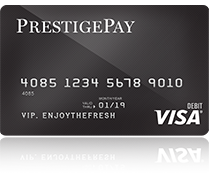 PrestigePay Visa® Prepaid Card is issued by Sunrise Banks N.A., St. Paul, MN 55103, Member FDIC, pursuant to a license from Visa U.S.A. Inc. This card may be used everywhere Visa debit cards are accepted. Use of this card constitutes acceptance of the terms and conditions stated in the Cardholder Agreement.